The maintenance and promotion of the rule of law is of fundamental importance for the human dignity and well-being of people everywhere, providing the foundations for good governance, an effective economy and a fair society, and affecting the daily lives of people around the world. Its relevance extends across a wide range in the affairs of people and states: in the laws of armed conflict; laws outlawing corruption and governing constitutional affairs; in energy and environmental rights; the respective roles and powers of the various arms of government and agencies at national, regional and international level; the independence of the judiciary; and in human rights. - the effects of international criminal law and practice. The analysis is given by some of the leading lawyers in the world-Yves Fortier, Mary Robinson, Jane Stapleton, Keir Starmer and Lord Bingham-as well as the senior researchers of the British Institute of International and Comparative, as it celebrated 50 years of promoting the rule of law in an international and comparative context. 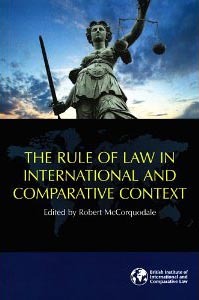 "The Rule of Law in International & Comparative Context"